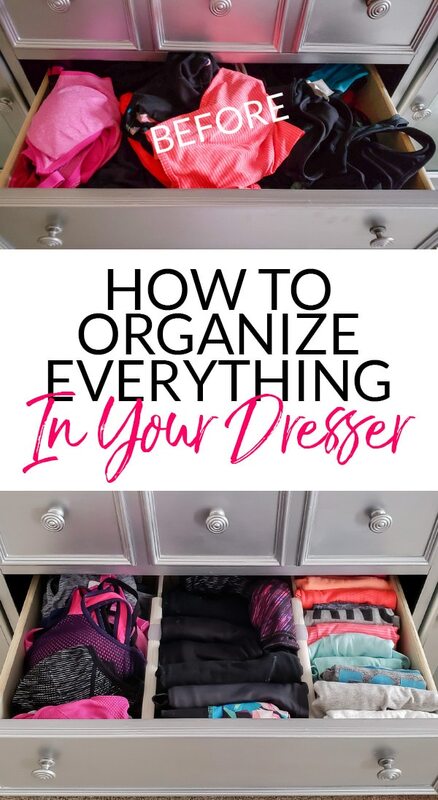 We’ve talked before about decluttering clothes, but I never covered how to clean your dresser and keep it organized. 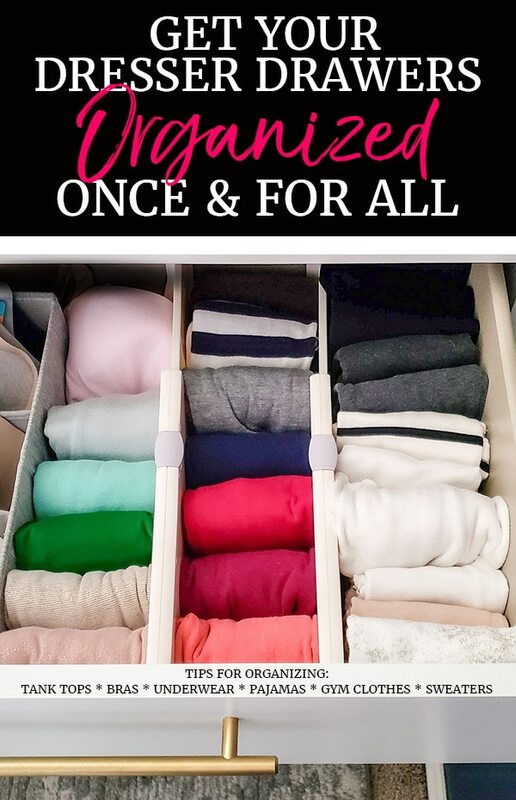 The state of my own clothing storage has been deteriorating for some time, so it was the perfect chance to highlight my favorite drawer organizing ideas for you! With my focus on being AHEAD this year, I needed to tackle a recurring chore that always makes me feel behind – laundry. Over the fall and winter, things piled up and felt like I could never catch up. Initially, I wasn’t sure why this task had gotten out of control. When I hit pause and thought about it, I realized that the source of the problem wasn’t actually dirty clothes. It was the clean ones! 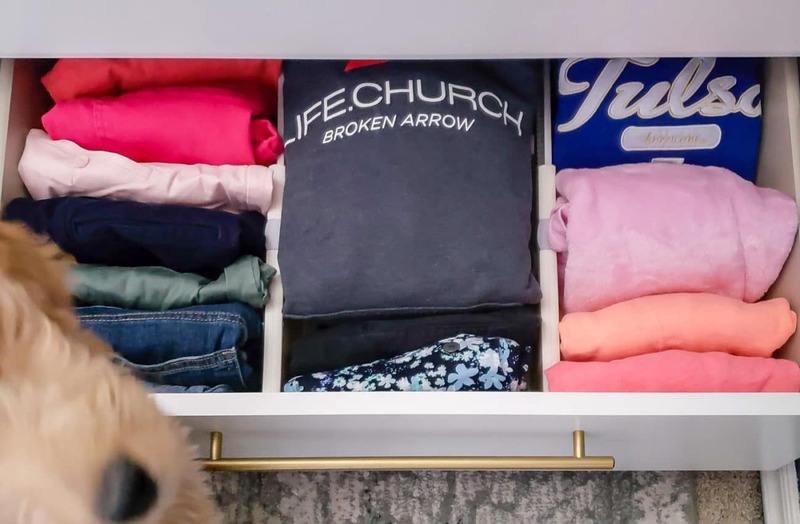 I had done a terrible job following the one in, one out rule with clothing the last year after following it the first two years after our closet remodel. We were constantly running out of hangers, and the drawers were stuffed. Both made the laundry process frustrating. Plus, owning more clothes means that laundry can get very built up before you HAVE to tackle it. But, even if you’re always ahead with your laundry, I think you’ll find some ideas for your home as I share how I fixed ours! Organizing Tip: Start your drawer organization with the hampers as empty as possible. The first reason is the most obvious – if you organize when half your clothes are dirty, you won’t have the right space allotted on those magic days with things are almost all clean. The second reason for this became apparent to me throughout the day. With each load of laundry I finished, I magically found more clothes in drawers and on hangers that I was okay donating. When I started off by comparing all the existing clean clothes to each other, I removed 10-20% of them and kept the rest. But really, the clothes I wear most often would logically be the ones that started the day in the hamper. As those emerged from the dryer, suddenly they became the new keepers and I could get rid of more of the others. Don’t consider the purging phase in isolation, keep your eyes open for more you can ditch as you go throughout the day! Organizing Tip: Start by removing EVERYTHING from the drawer you are working on. 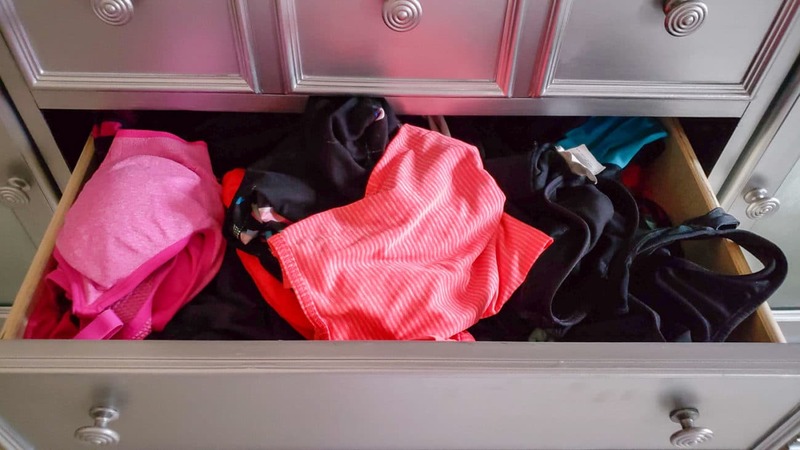 If you have 2 drawers of the same item (like T-Shirts), work on them at the same time, removing everything from both at once. Having to work to get acceptable attire together for the gym was just one more excuse to delay exercise, so I needed to fix the drawer pronto. 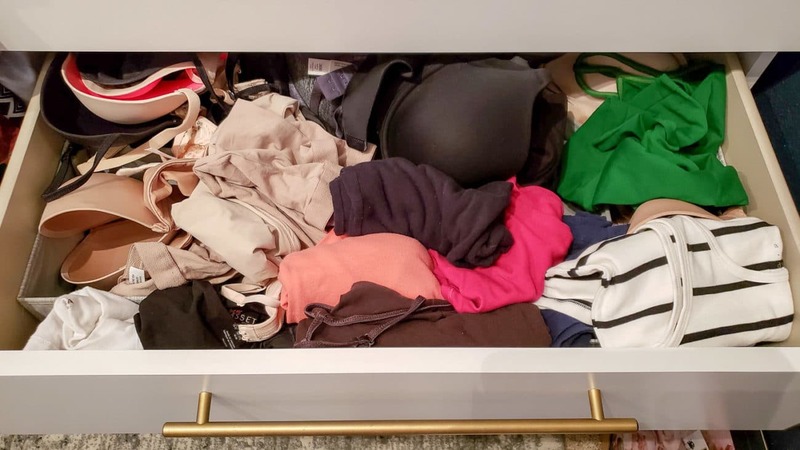 I decided to divide the wide dresser drawer into 3 sections – sports bras, bottoms, and tops. 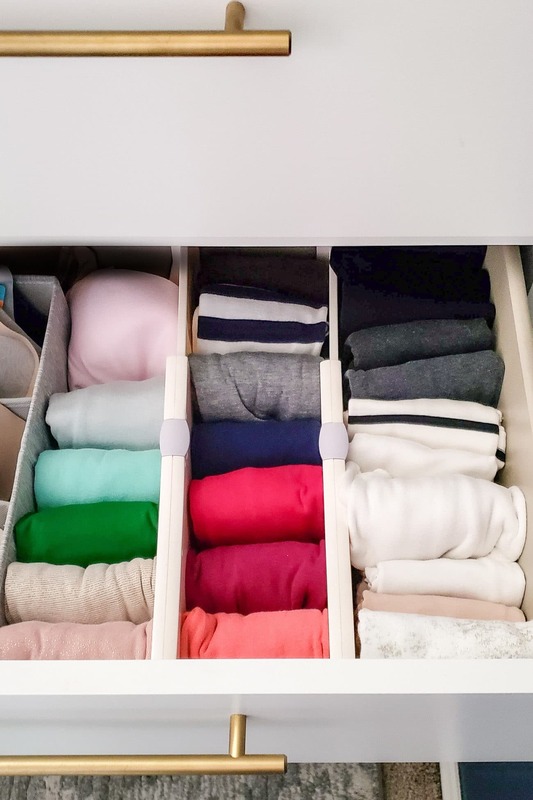 After researching different drawer dividers, I found some on Amazon that are a bit taller than others, so perfect for clothes. PS: After my first order of them, I noticed that you can enter berryave as a coupon code to get 10% off 2 sets, or 15% off 3 sets. I used that when I ordered more for Corey’s drawers! Can you believe this is the same drawer AND there’s actually more in it than before since everything is clean? 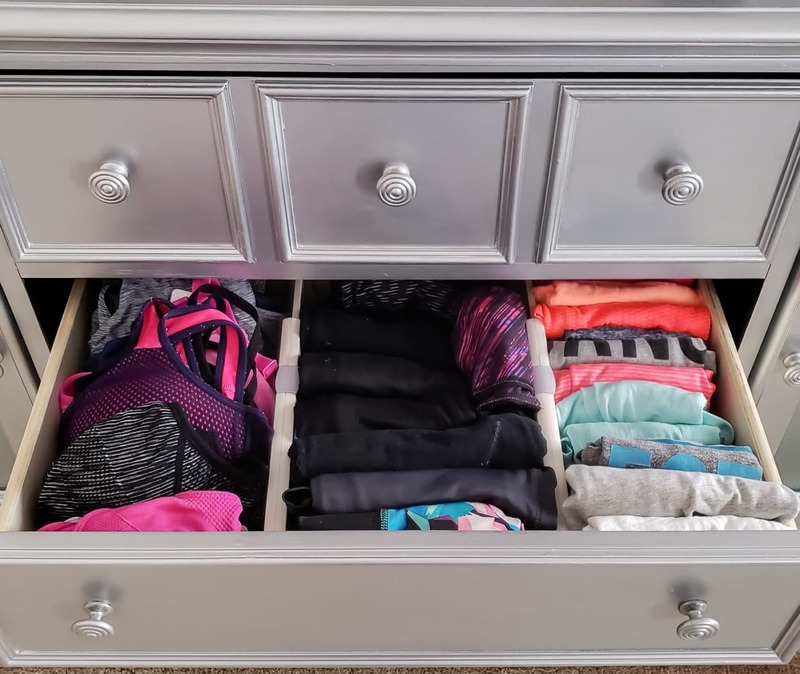 With the workout drawer organized, I was on a roll and couldn’t wait to tackle the main closet dresser! Like some of the other drawers, this one had been organized at one time, but there were problems with the system. 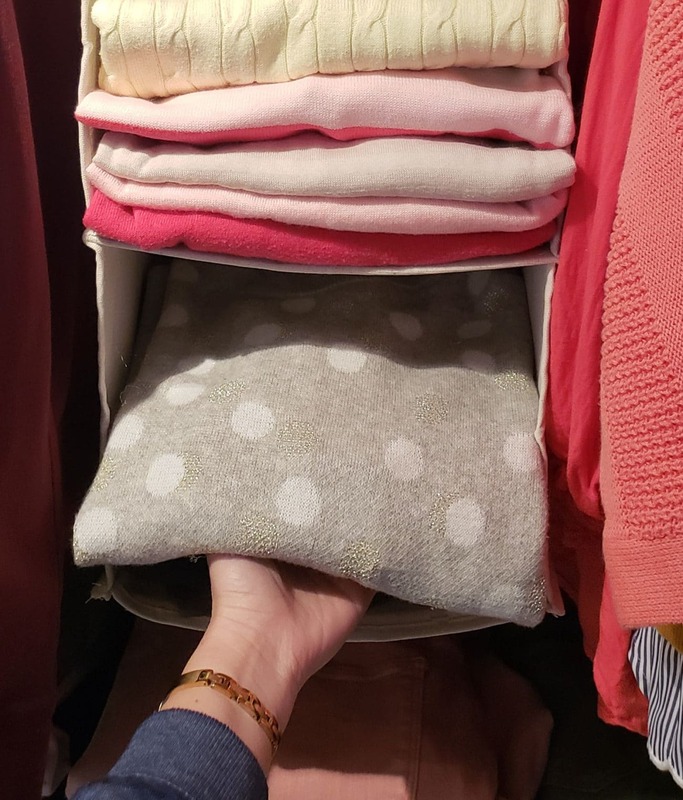 The large winter socks didn’t fit well within the divided areas, so would end up on TOP of the organizer. And at least 1/3 of the space was filled with dress socks that I might wear once or twice a year. 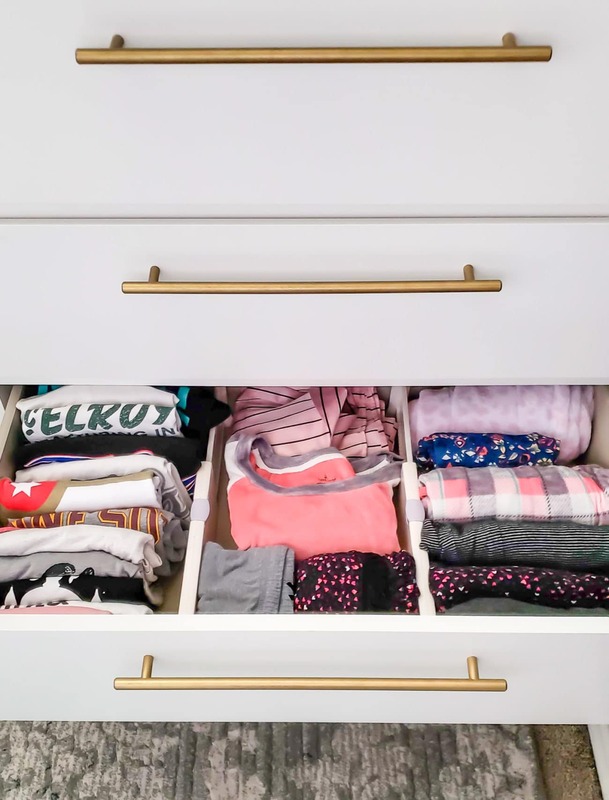 When you’re organizing your dresser drawers, consider making primary, daily use drawers and then separating infrequently used items to another drawer or bin to keep your main space uncluttered. I removed all the dress socks from the closet dresser and everything fits better now! While I was at it, I also threw away any holey socks or pairs I NEVER wear. We had space in the bedroom dresser for the dress socks, but I also could have tossed them in a photo box or basket and put them on the top shelf in the closet. I changed sock organizers, opting for a solid plastic unit this time. One of the containers with the set doesn’t have dividers (designed for bras), but I’m using it for the bulky socks. SO MUCH BETTER! That set also comes with smaller organizers that are perfect for maximizing leftover space in the drawer. They now hold the awkward, tiny no-show socks that always got lost before. 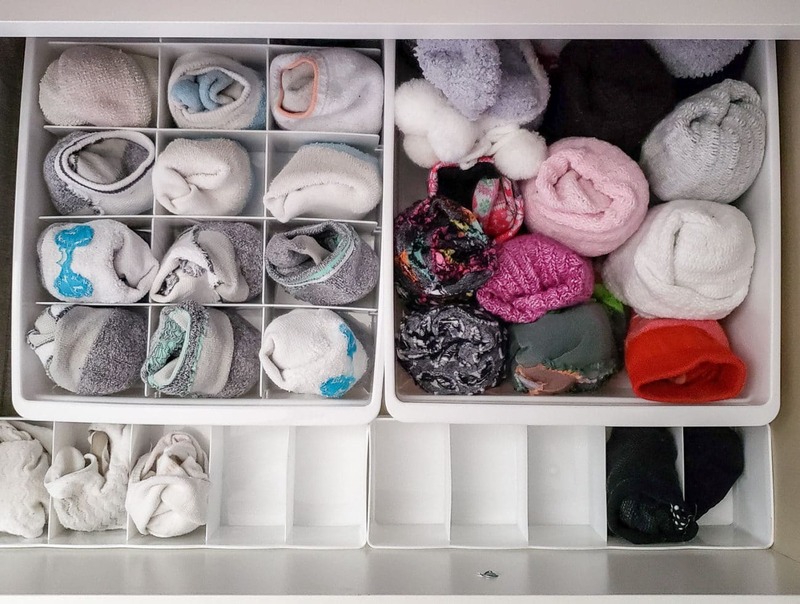 My underwear shares the top drawer with the socks, sorted into an existing organizer. I almost had fun throwing out older pairs that I only resort to when there is a laundry situation. Life is too short for annoying undergarments! I previously rolled them, but realized that folding them into rectangles takes the same amount of time and they fit better in the divided sections. Like the dress socks, the Spanx style undergarments got nixed from this primary dresser. Thankfully they only come out a few times a year, so there was no need for them to be living in prime real estate. I had MANY bras that had been purchased over the years, but you know how many I routinely wore? ONE. The rest were hidden in a drawer surrounded by out of control tank tops. I couldn’t find more of the same style/model that I loved, but couple weeks ago, I realized that I could at least order a few of the same brand on Amazon of all places. Imagine my delight when one of them turned out to be exactly like my favorite! And they were affordable – most colors were half the price listed on the tag. I immediately decided to order 4 more in a variety of colors and donate or trash every other uncomfortable, ill-fitting bra that was cluttering my drawer. It felt like a total splurge, but was well worth the $80 to start fresh. I already had a bra organizer in the drawer (similar to this), it was just overstuffed and buried. Now it works perfectly! I blame Target and their crazy clearance prices for the number of tank tops in this drawer. Using my new favorite drawer dividers, they now live folded in neat rows! This one was another doozy in desperate need of dividers. The “pajama” drawer was an overstuffed mess of a zillion Tshirts for sleeping or painting or housework PLUS actual pajamas AND a hoodie that somehow got jammed in. I sorted through the shirts, adding many to the donation pile, with a natural cap to the number I could keep based on the section I assigned to them. Pajama pants also got their own row, and I only kept as many as would fit. While Marie Kondo is too minimalist for me and I don’t like giving material items enough value to be thanked, there is always something you can learn from others! 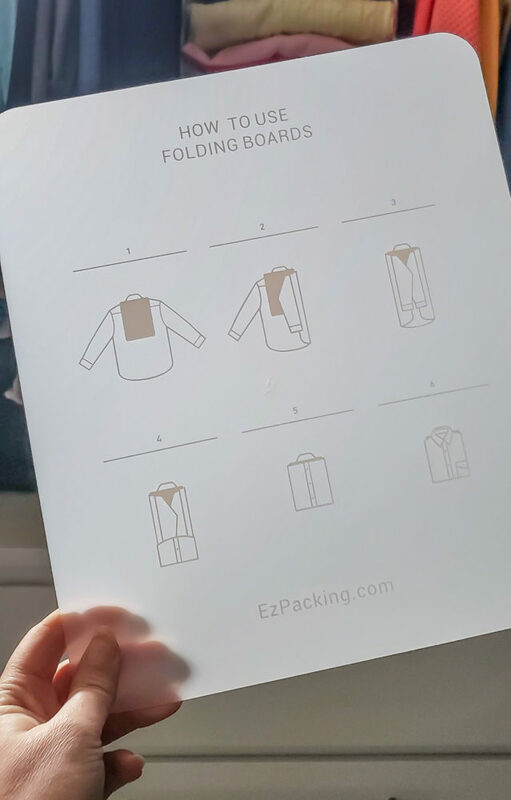 In this case, I’m now a big fan of file folding clothing. 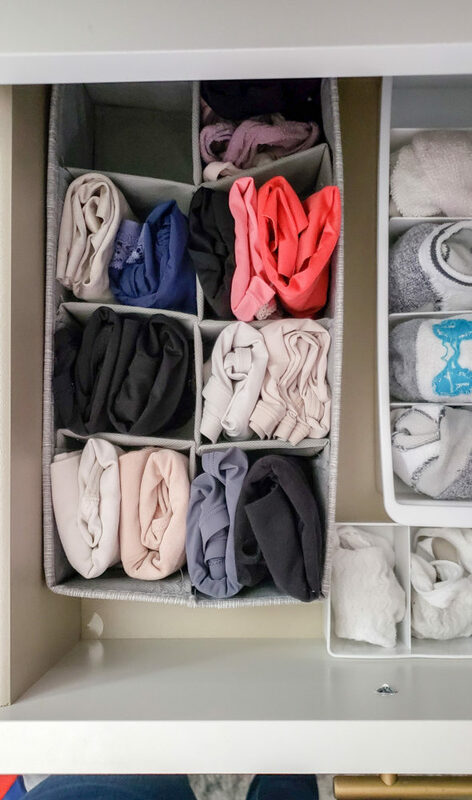 I think I do a more simplified version of hers, but basically folding anything into smaller rectangles that will stand up makes it easy to see what you have AND more fits in each drawer. Win-win for someone with a more Lagom approach (Lagom is Swedish and means Not Too Little, Not Too Much). 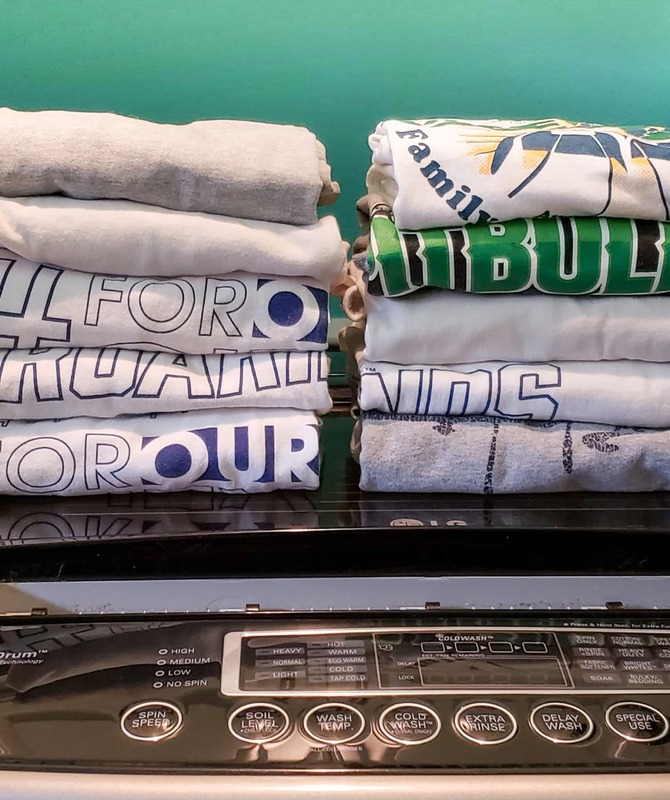 The file folding method works for more than tee-shirts. Here’s what the last drawer in the closet looks like now with my shorts filed, Gus photo-bombing, and my new favorite dividers in place to keep things tidy. The last change I made with my clothes solved a big issue. I’ve been hanging my sweaters because of limited drawer space in the closet. While the velvet hangers don’t create the same problems as wire hangers, I’d still get bumps in the shoulders and stretching. 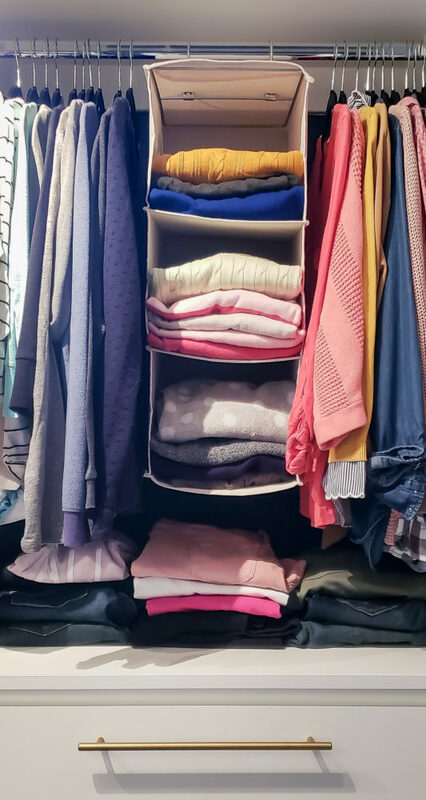 I realized I could add an inexpensive hanging shelf system and store more sweaters folded than used to hang in the same space. The medium folding board from my travel packing cubes is the exact size needed for this hanging organizer. It’s faster to use the board instead of trying to fold every sweater the exact same width. As always, you can use code POLISHEDHABITAT15 on the EzPacking site to save 15% on any order! Whew! So that’s how a little desperation to get our laundry and my gym clothes under control turned into beautifully organized drawers! Do you feel like you’re ready to clean your dresser now? My friendly UPS man is bringing us more dividers to use in Corey’s drawers today! I started file folding his shirts, so now there is a neat pile of them in the laundry room waiting for his dresser to be cleaned out. Can’t wait! Next time I find myself shopping for clothes, I’m going to try to picture what I can donate to make room for the new items. If I don’t want to get rid of anything, nothing new can come home! It’s ridiculous, but when my clothes are a disorganized mess, I tend to buy MORE. When things are tidy, I can visualize whether I really need an item and if I have room for it and I make better decisions, usually choosing a smaller number of higher-quality pieces instead of picking up 6 cheap shirts at once. Here’s to getting back to better clothes-buying decisions! Okay, who else has messy drawers and is committed to cleaning them out ASAP? Let me know if the comments below and feel free to ask questions if I missed anything! We have VERY limited closet space, So limited that we have two wire shelves one above the other. He has the top and I get the bottom shelf. The closet is in constant disarray, any tips for utilizing small closet space? Also what about clothes I hope to one day fit into again? Donate or storage? Ah, the constant battle of clothes we hope to fit into again. I have those too. 🙂 Take a realistic look at them, if something is one size too small and you love it, keep it with the active items IF you’re taking some kind of actions to fit into again. And then as soon as you do, donate the clothes that are now too big ASAP. If you have bigger clothes, it’s way too easy to expand into them again (speaking from experience here). If something is a size 2 and you’re a size 12, just ditch it. If you work your way back into that size, you deserve a whole new wardrobe. So really, it’s about being optimistic, but realistic about what you think you can fit into this year. If you’re happy enough with your current health level that you aren’t actively trying lose weight, but just have a vague notion that one day you’d like to fit in the things you could wear in high school, I’d donate as well. Does that help at all? I fold my sweaters over a velvet hanger…just another idea if someone wants to “hang” sweaters but doesn’t want them to stretch or get weird shoulder shape. Also, I use a hanging cloth shoe organizer (like your sweater organizer pictured above) and I keep my bras in those. It’s the perfect size to easily access them, store them carefully & properly, and to choose the right bra for the shirt/dress I’m planning to wear that day since it’s in the closet where I’ll be choosing my outfit. I keep lots of random things in some of the other “shoe” cubes (all shoes are store in the garage bc we don’t wear shoes in our home.) It’s a good solution for your dress socks, spanx, hats, gloves, out of season scarfs if you don’t have a scarf hanger, etc. Those are GREAT tips as well Milisa! Thanks so much for taking the time to share them, I know other readers will find them really helpful! Thank you! I have some workable solutions to our current closet from this post. I appreciate the detail and links! I’m redoing our closet and I believe we’ll use the iKEA items also. I had some of those as saved photos but now have a more solid idea of where to go with them. 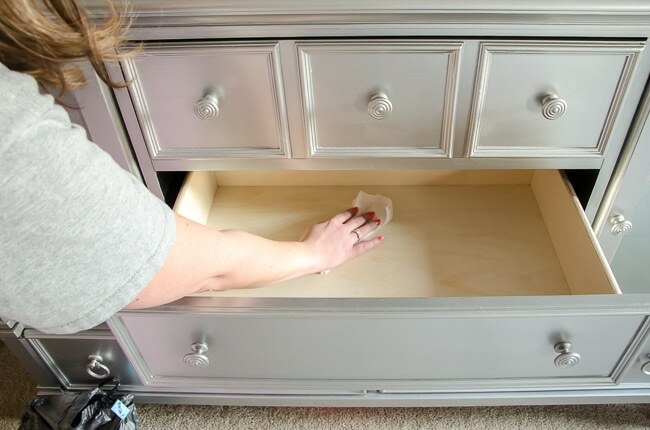 I also like the decorative touches and handles on the drawers. Excellent work! I’m so glad it was helpful! We couldn’t be happier with IKEA dressers – the drawers slide so easily and are deep enough to be functional without being too deep. Happy remodeling!